DX Ball 2 Game - Download and Play Free Version! Destroy the Bricks and Stay Alive! DX Ball 2 puts you in control of a paddle and a ball. Your goal is to break and destroy all the bricks on the board in order to advance to the next level. 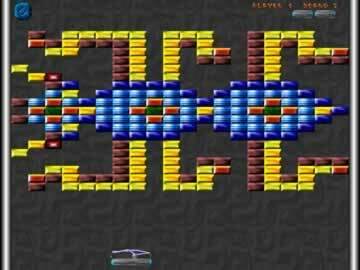 This simple gameplay is made more complex by the types of bricks on the board. Some require more than one hit to disappear, while others are invisible until they've been hit by the ball. Missing the ball equals losing a life, and losing all lives is game over. Keep an eye on the ball at all times! Thru Brick: Allows the ball to pass through multiple bricks, regardless of type. Set-Off Exploding: Triggers all explosives on the board. 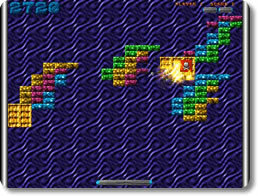 Fire Ball: Blast away bricks with powerful fire! Shooting Paddle: Adds two guns to the edges of the paddle, allowing you to shoot bricks. Grab Paddle: Makes the paddle sticky so the ball stays put on contact. Extra Life: Gives one spare paddle. Level Warp: Instantly clears the board and starts the next one. 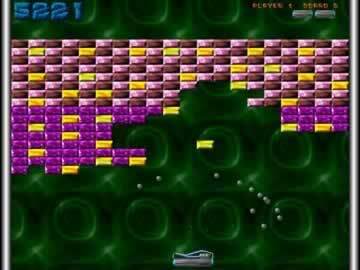 Zap Bricks: All special bricks are weakened by the zap, making them easy to destroy. Slow Ball: Slows the ball. Expand Exploding: All explosive bricks are made accessible. Kill Paddle: Instant death and loss of one paddle. Shrink Ball: Makes the ball tiny and hard to control. Fast Ball: Ball darts around at full speed! Falling Bricks: When the ball hits the paddle, bricks inch closer and closer, eventually resting right above the paddle. Expand Paddle: Makes the paddle bigger. Shrink Paddle: Reduces the paddle's size. Split Ball: Splits the ball into two. Mega Ball: All balls on the board are made bigger. Eight Ball: Splits a single ball into eight. The blue items are generally very helpful, while the gray are neutral depending on the situation. Red items are almost always bad and should be avoided. Keeping an eye on the ball while watching out for bad items adds a new level of challenge to the game! Th games stays fresh and interesting with the availability of six dramatically different board sets. Additional board sets may be added later on as well, giving fantastic replay value. DX Ball 2 is a great game for focused puzzle lovers looking to pass both long and short periods of time. It never fails to deliver a satisfying gameplay experience!